We discussed Sherlock Hound on these pages before. Between November 6, 1984 and May 21, 1985, 26 episodes of the animated series Sherlock Hound aired in Japan. Based on the Sherlock Holmes stories, the characters were portrayed by anthropomorphic dogs. We’ve also discussed phone cards before. Many of the visitors to this website probably recall the days when pay phones were a common site when walking down a city sidewalk or inside a hotel lobby. You would drop a few coins into the phone, dial the number and make your call. Perhaps you would use a calling card if you were making a long distance call. In the mid 1990’s, there started to appeared prepaid calling cards by some enterprising companies, such as AmeriVox. These prepaid calling cards would generally have 50 call units that would be redeemed at a fixed ratio as the call progressed, until the card would have no remaining call units. 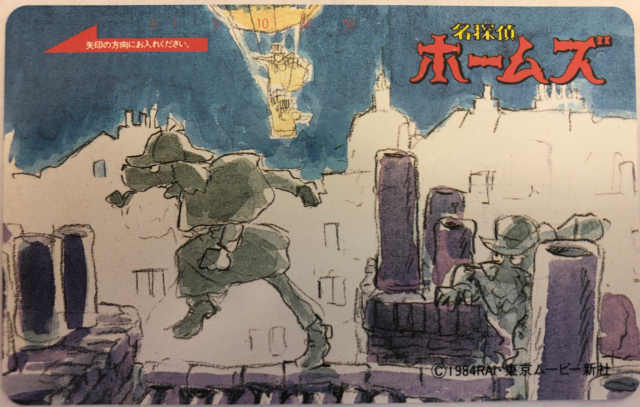 This Japanese 50 unit calling card features Sherlock Hound and Dr. Watson searching out a mystery on the rooftops of London. In the distance, Professor Moriarty can be seen aloft in a hot air balloon. The card features the colors of white, yellow, red, green and purple. It would be interesting to learn if there are additional phone cards featuring Sherlock Hound. A Sherlockian Phone Card from Flip Side Co. Ltd.